How to know if eating sufficient calories for muscle growth? As brief background: years ago I was obsessed with getting a 6-pack. I was possibly the worst body type: skinny but with a flabby midsection. After years of P90X, I didn't quite achieve a 6-pack, but I did get a nice 4-ish pack; I still had to flex a little to see it on my skinny frame, though. Now: I feel like I'd like to gain some muscle mass. I've read from various sites, including this StackExchange, that when adding calories to fuel muscle growth (along with exercise, of course), it is inevitable that you will add some fat, i.e. your gained weight cannot be 100% muscle. Question: I plan on ramping up my caloric intake, perhaps in 100 calorie increments, while doing a muscle growth-themed workout (Body Beast). How can I know whether I'm getting sufficient calories to fuel muscle growth? Although I cannot avoid some gain in fat, I would like to minimize it, which is why I am trying increasing my calories in 100 calorie increments. Also, what would be the long-term (weeks/months) effect of performing a muscle growth-themed workout without ingesting sufficient calories? By knowing what to expect. Gaining 1 lb (.45kg) of muscle each month is a quick rate, while 2 lbs (.90kg) of muscle each month tends to be the upper limit. Fat is much quicker with 6 lbs (2.72kg) per month being fairly easy to gain with a sufficient caloric surplus (~50%). What determines if the weight you gain is fat or muscle? Your activities and nutrition have an intertwined relationship with your resulting size and shape. I like to say it like this; your nutrition will determine your size while your activities determine your shape. Without any physical activity, your body has no reason to add any muscle to your frame while in a caloric surplus, therefore 100% of your increased weight should be fat. With the "ideal" maximum amount of physical activity stimulating muscle growth (along with proper rest and nutrition) your body will add the maximum amount of muscle that it can, but it's limited in capacity (2 lbs tends to be the upper limit). The conclusion here is that while in a caloric surplus it is possible to gain both fat and muscle, but the latter is only possible by providing a stimulus. To minimize fat gain, you'll want to keep your caloric surplus from growing beyond what you need for muscle growth. In general, this boils down to watching the scale. If you are gaining between 1 lb and 2 lbs (.45-.90kg) of weight per month while providing your body with sufficient exercise and rest, then you can assume that most of that is muscle. 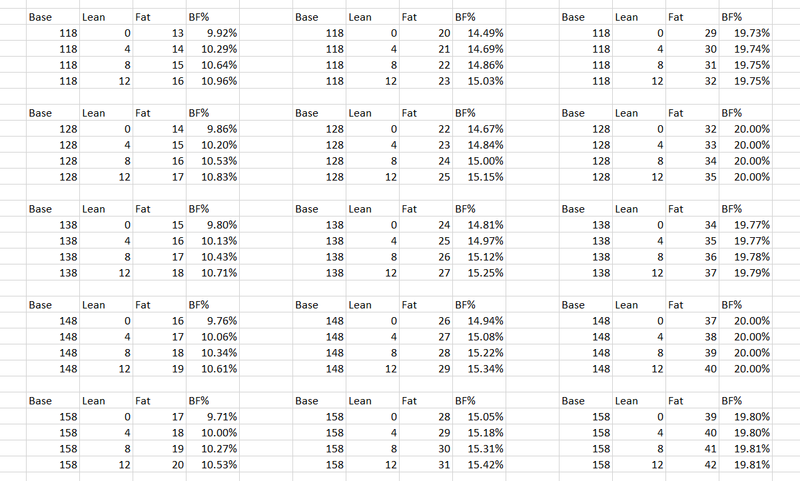 At worst with this kind of lean bulk, you might expect to gain 1 lb of fat with every 1 lb of muscle. If you're really at 17-20% bodyfat though, you're a prime candidate for a body recomposition. For that, you simply want to maintain your bodyweight. What happens during a recomposition is that your body uses its own fat as calories to fuel muscle growth. So you lose fat while building muscle. My advice would be to do the recomp if appearance matters to you, do the lean bulk if it doesn't. You can always do a bulk later after your bodyfat percentage gets low enough. "I plan on ramping up my caloric intake, perhaps in 100 calorie increments" - This is probably the best route, perhaps not the quickest, but probably best. Continue doing this until you reach the desired monthly change on the scale. "What would be the long-term (weeks/months) effect of performing a muscle growth-themed workout without ingesting sufficient calories?" - If you have enough fat, you'll start burning the fat. If your caloric deficit is too large however or your bodyfat percentage is too low, you'll start losing muscle too. You'll also notice a dip in energy. "I know gaining muscle mass is a years-long endeavor." - Yep, and knowing about how much growth to expect at a time is key in optimizing both motivation and results. Not the answer you're looking for? Browse other questions tagged calories weight-gain muscle-gain or ask your own question. Eating more calories to improve performance? How can I consume more calories without feeling bloated? What are reasonable numbers of lean muscle mass growth? Do calories burned for activity include RMR-burned calories? 5000 Calories to build muscle? Or to bulk? How do I know how many calories I take daily? Can't get big arms in a sparing calorie deficit?